I’ve a confession to make. 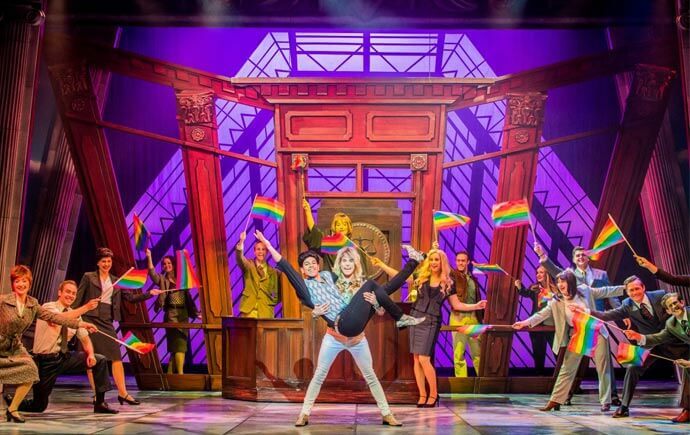 I’m a big fan of Eastenders, and as such, I couldn’t wait to see Rita Simons (or Roxy to fans of the BBC soap) in the lead role in the touring production of Legally Blonde at the Lyceum. So I guess you could say I was rather disappointed when I realised she would actually play brassy salon-owner Paulette Bonafonte, and X Factor finalist Luci Jones was taking on Elle Woods. That’ll teach me not to do my research. Thankfully, my fears that Jones would be outdone by her more experienced co-star were totally unfounded, and as much as I was looking forward to seeing Simons in action, it was the former reality TV star who totally stole the show. For those not familiar with the Reece Witherspoon career-launching Hollywood movie, it told the story of sorority sister Elle Woods, who gets herself a place at Harvard Law School in an attempt to prove she’s not just a pretty face and to win her boyfriend back. The musical is a reasonably faithful retelling, punctuated with a number of toe-tapping, catchy songs, and is electric from start to finish. With three set changes, a Chihuahua and saxophonist within the first five minutes, I knew I was in for a great night. And while you’d expect someone who came to public attention on a singing competition to be able to wow the audience with her singing voice, what really stood out and surprised was Jones’ comic timing… she was hilarious. Simons was excellent in support, and in hindsight much more suited to the lovable Paulette, while David Barrett is also a delight as Elle’s pal Emmet Richmond. And what really stands out is that this production has all the hallmarks of a top end West End show, not remotely diminished by turning up in Sheffield in late autumn. To my mind, it’s one of the most joyful and warm-hearted productions of the year.